trash: Choose an icebreaker. 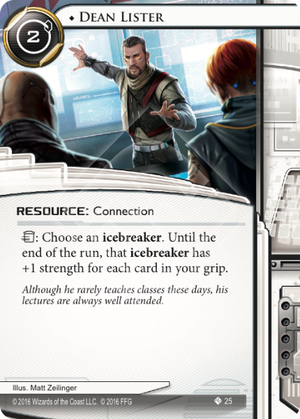 Until the end of the run, that icebreaker has +1 strength for each card in your grip. Although he rarely teaches classes these days, his lectures are always well attended. When does the ability from Dean Lister expire if activated outside of a run? It expires immediately just like an icebreaker boosting its own strength. Is the strength increase from Dean Lister locked in at the moment the ability resolves, or does it track the number of cards in the Runner’s grip? The latter. Dean Lister confers “+1 strength for each card in your grip” to the icebreaker until the end of the run. Dean provides excellent value if you need the strength for more than one ice in a run. But how can you get value from Dean if the corp doesn't put all their sentries in the same server? By using ice that that can break more than one type of course. Most obviously, this means an AI breaker like Overmind, Brahman, or the newly released Mammon. Dean has anti-synergy with the King of AIs, which is probably for the best. Speaking of newly released cards, the smart person breakers can often be used multiple times a run much like an AI breaker. Furthermore, a code gate breaker is often useful multiple times per run with Kit. Dean can also be a lifesaver in a deck that relies on fixed strength breakers.